Chemical fume hoods provide protection from vapors, splashes, and impacts caused by chemicals and their reactions. However, fume hoods do not completely eliminate the hazards, they must be used correctly to minimize the chance of exposure. Notes: Biological safety cabinets are not equivalent to chemical fume hoods and do not provide protection from hazardous vapors. Procedures in which perchloric acid is heated above ambient temperatures must be performed in a specialized fume hood equipped with a wash-down system. 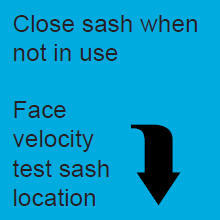 Figure 2: The blue arrow sticker on the left indicates the maximum operating height for a hood with a vertical sash (moves up and down).The blue arrow sticker on the right indicates teh sash test locations for hoods with horizontal sashes (moves side to side). 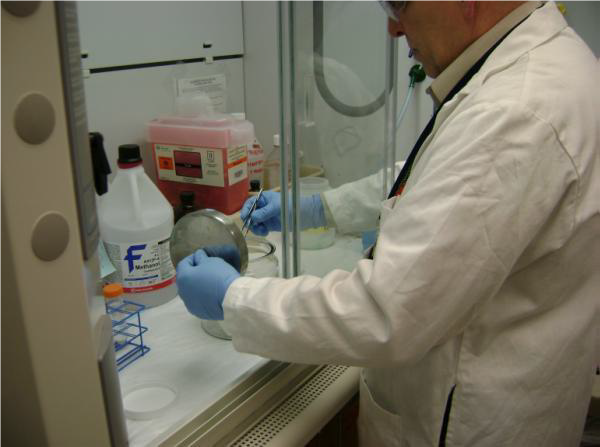 A campus-wide Chemical Fume Hood Surveillance Program is coordinated by the Occupational Safety and Health Department (OSH). 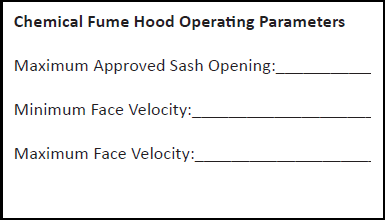 Fume hood velocity is measured annually by OSH. 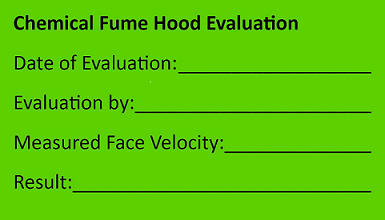 If the velocity falls within the operating range established by the campus of 80 and 120 linear feet per minute (fpm), or within the operating range esbalished by the manufacturer and verified through as-installed containment testing, the hood will receive a green Chemical Fume Hood Evaluation tag bearing the date of the inspection as shown below in Figure 5. 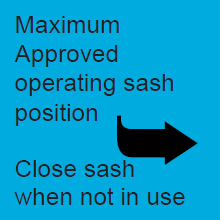 Approved operating flow range and maximum approved sash opening are listed on the white Chemical Fume Hood Operating Parameters sticker that is placed on teh fume hood and shown below in Figure 6. If research work in your fume hoods is critical, the Facilities and Services (F&S) Sheet Metal Shop can provide annual testing and immediate repair by requesting a Preventative Maintenance work order through the F&S Service Office. 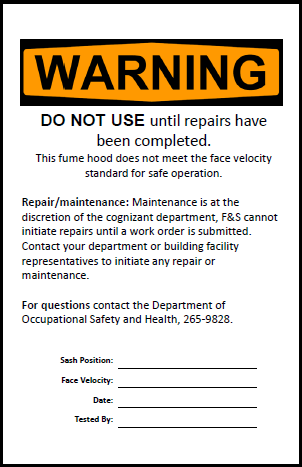 If the face velocity is outside the range listed on the Chemical Fume Hood Operating Parameters a WARNING sign willb e posted on teh sash and the previous year's green tag will be removed. If a WARNING sign is present, contact your facility manager for repair, OSH and DRS cannot initiate repair of failing hoods. Do not use hazarous material in the hood until it has been repaired and is working properly. The F&S Sheet Metal Shop will re-test the hood as part of the repair work. A copy of the WARNING sign is shown below in Figure 7. Do not position large equipment or containers of chemicals in the back of the hood where they block airflow. Elevate equipment by placing it on blocks, jack stands, or legs so that air can flow underneath to the bottom baffle slot. To store items in the back of the hood, install shelves to elevate containers (see Figure 8). Keep inside the hood only what needs to be there and remove everything that can be stored outside. When the hood is not in use, keep the sash at a six-inch opening. This will significantly reduce energy consumption and the sash will act as a shield in the event of an unexpected release. Ductless fume hoods are not recommended due to limitations on chemical use within the hoods and required maintenance. OSH and F&S do not provide support for ductless fume hoods. Verification of proper operation and maintenance/repair is solely the ersponsibility of the owning department. Chemical fume hood testing information can be accessed through the links below using your Active Directory user name and password. This database is best viewed using Internet Explorer. If you have questions about properly using chemicals in your fume hood or storing chemicals please emails DRS at drs@illinois.edu. If your hood is not operating properly please contact yoru departmental facilitiy representative. If the interior of the hood or exhaust system must be accesssed to complete the repair your department will be asked to complete its responsibilities as described in the Lab Exhaust Maintenance SOP.